Hurricane Charley struck Florida as a powerful category 4 storm causing extensive property and tree damage. Power was out for weeks, gas shortages were common, Disney World and Universal Studios were shut down costing both attractions lost revenue in the millions. Hurricane Charley was the 5th strongest to hit the U.S. and ranks as the most powerful to strike the Orlando metro area since Donna in 1960. I moved to Orlando, Florida for an internship at Disney World a couple of months prior, followed by Charley and an active hurricane season in Florida. When I started work, I began to get to know my cast members who lived in Florida all their lives and most mentioned the state was overdue for a powerful storm to hit the state. The last big threat was Hurricane Floyd in 1999. It was on track to hit the central part of the peninsula but it had curved north and weakened significantly as it made landfall in North Carolina. That was the first time in history that the Disney parks were closed. Overall, since Hurricane Andrew in 1992, there wasn't much activity across Florida. As the month of August came around the tropics were starting to heat up. Wednesday August 11th, Floridians took notice of Tropical Storm Charley in the Caribbean Sea. 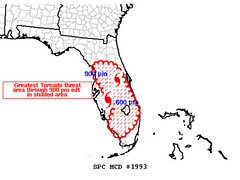 Some of the computer models projected the path to curve around western Cuba up north near Tampa Bay, Florida. By the 12th, the storm had gained strength and would maintain its intensity as it crossed the western tip of Cuba. It was a consensus that it would strike west of Orlando and closer to Tampa Bay as a high end category 2 storm on the 13th. On the morning of Friday the 13th, Hurricane Charley had maintained its category 2 strength and was moving northwest passing just west of Key West, Florida. Tampa Bay was still considered to be ground zero. As the 11:00 a.m. hour came, the track and strength of Charley changed drastically. The trajectory was more north and even slightly east of due north. Local meteorologists began to pick up on this trend as well. The trough/cold front across northern peninsula was pushing the Florida hurricane further east than what the models had predicted. The National Hurricane Center issued a special advisory noting Charley had rapidly strengthened to a category 3 as a major hurricane. The first rain band moved from south to north across most of Orlando as tornado warnings were issued for this line. As the storms approached a long hanging wall cloud passed over my apartment. It advertised broad rotation, but contained no tight circulation where a tornado would be imminent. Soon after, the National Hurricane Center issued another advisory saying Charley had strengthened to a strong category 4 storm with winds at 150 mph. Another rain band moved through with more tornado warnings issued but they only contained heavy rain and brief gusty winds. Hurricane Charley had made landfall at Punta Gorda, Florida and raced northeast across the central part of the state headed towards Orlando. The winds became strong gradually as the eye got closer. By 7:00 p.m. tropical force storm winds had overtaken the entire region blowing from the northeast to the southwest. The winds aloft (that you could visually see as the rain was falling) became stronger as the eye approached. The center of Charley passed about 1-3 miles to our east producing 70-90 mph wind gusts for about 15 minutes. The hurricane was small in diameter that contained a very small tight center. Its fast speed around 20 mph and the moist flat Florida terrain prevented the storm from weakening right away. Many homes sustained roof damage and downed trees were common across the Orlando metro area. Power was out for weeks across Florida due to the hurricane force winds. Disney World had minimal damage but some areas of Magic Kingdom had downed trees. There were many Disney transportation road signs toppled over, but that was the extent of it. Charley's name was retired and was the strongest storm to hit Florida since Hurricane Andrew in 1992 at that time. Currently, it's the 6th costliest hurricane to have hit the United States. Make sure to browse the chase logs section for additional Storm Chasing Fever Chasing Adventures.